Three Rivers Museum is transformed into a coffee house atmosphere for these enjoyable evenings. Acclaimed for their instrumental prowess, onstage charm and soulful vocals, Vintage Wildflowers has developed an enthusiastic legion of fans with their vibrant Celtic, folk and bluegrass blend. 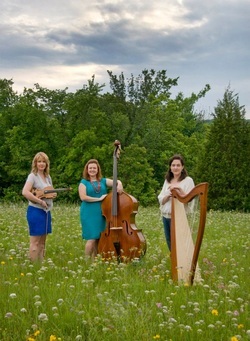 Their music reflects the lives and backgrounds of these three women, melding the trio’s wide-ranging musical interests with their Celtic music obsession. Vintage Wildflowers are:Abby Bozarth - fiddle, mandolin, harmony vocals, guitarDana Fitzgerald Maher - Celtic harp, piano, harmony vocalsAudrey Schmidt - lead vocals, bass, guitarJoin us for a wonderful evening of beautiful music! Saturday July 19th 7:00 p.m.
Tickets $12 per person or $10 per person for museum members.